Telzio was created by Peter Schroeder in 2013 as a solution to what he quickly found was a gaping hole in the cloud based phone services that were currently available. He wanted a system that was quick and easy to configure – think drag and drop, had an Interactive Voice Response Menu system, and allowed for international phone numbers. But he also wanted a solution that was cost effective. Out of this need he created Telzio. A Cloud based phone system whose core value proposition is its ability to get businesses phone systems up and running quickly and easily. Who is Telzio Best Suited For? Telzio starts at 1000 minutes and 0 SMS messages for $50 for a local number or $60 for a toll free number. From there you adjust the number of minutes and SMS messages you need and the price is reflected accordingly. This allows business owners to configure exactly how much they feel they need. You can easily adjust both of these settings online at any time, if you feel you need more or less minutes or SMS. Easy configurability is one of the Telzio strong suites. Telzio also offers a full 30 day free trial, so you can easily try out their system without commitment. There are never any contracts, termination fees, or setup fees. All minutes are shared amongst all users on the system, so you can easily add users without increasing the cost of your phone system. You pay for minutes used not per user. 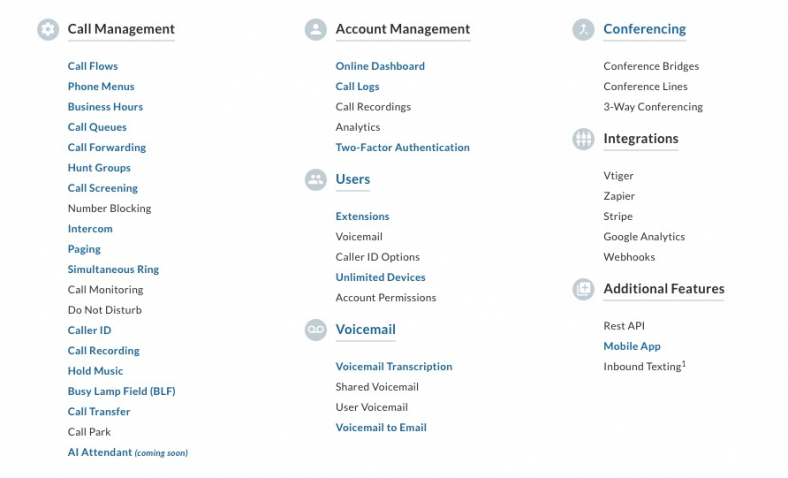 This sets them apart from most other cloud based phone systems. 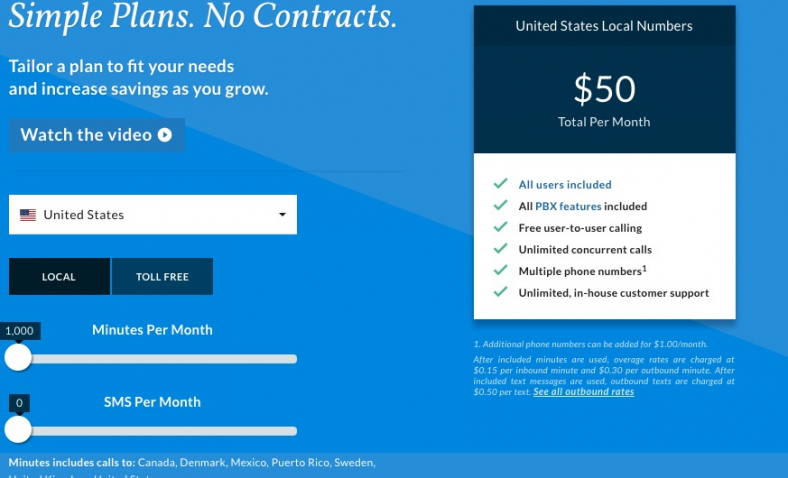 You can add phone numbers over the initial one you get with the plan for $5/month. Minutes (both toll free and local) are easily added, in 1000 minute increment starting at 1,000 and going up to 25,00+. SMS minutes start at 0 and goes up to 25,000 in 250 minute increments If you go over your minutes it can get quite pricey very quickly. 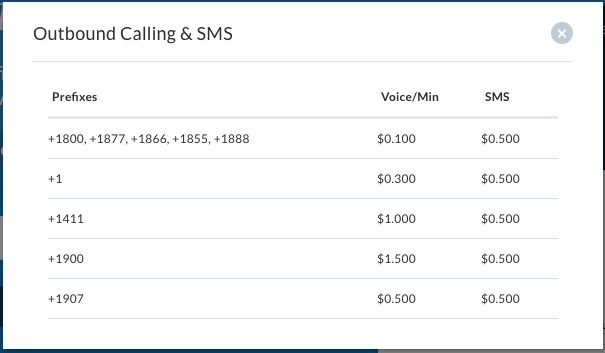 The cost of voice overage minutes is $.30 and SMS is $.50 for SMS. So it’s best to stay on top of your minutes usage and adjust as you need. All minutes can be used for US, Canada, Denmark, Mexico, Puerto Rico, Sweden, and the United Kingdom. Telzio currently does not offer any unlimited minute plans. 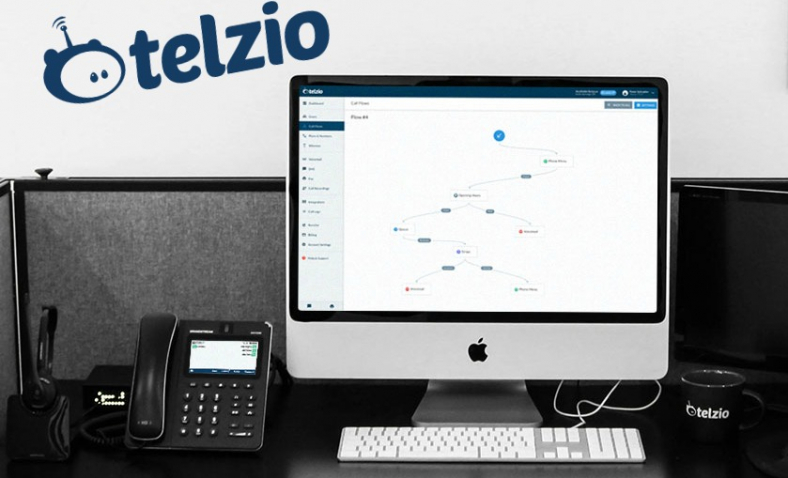 Telzio offers all the standard PBX features such as call forwarding, call screening, call routing, automated menus, call blocking, call transfer, hold music, hunt groups, call queues and many more. See a full list below. They also include features such as call recording, conference calling, voicemail to text transcription and unlimited devices as part of their standard service, where other providers charge an extra monthly fee for these. Telzio also offers premium features for an additional fee. These features include things like: Internet fax, toll free number porting (local and toll free numbers are ported for free), and International phone numbers. Telzio offers local, toll free, vanity and International phone numbers. You can port existing local, toll free and vanity numbers for free. As of right now, they will help customers locate a Vanity Numbers on a case by case basis. They hope to have a Vanity Number search feature available in Q2 of 2018. Toll Free, Vanity and Local numbers are free with your plan (for first one and then $1/month for additional numbers). Pricing for International numbers depends upon the country you want the number for. International numbers have their own Telzio plan and start with 1,000 minutes. An example would be a Denmark number would have it’s own plan for $50/month with 1,000 minutes. You can add an additional denmark numbers for $5/month to that plan. Unlike with some other service providers, with Telzio you can easily port out your number if you decide to leave. You own the number, not Telzio. With Telzio the offer the following integrations at no extra cost: Vtiger (CRM), Zapier, Stripe, Google Analytics, Webhooks. They also have a mobile app for IOS and Android, and an easily accessible REST API. Unfortunately inbound and outbound Internet fax is a premium feature you pay extra for with Telzio. 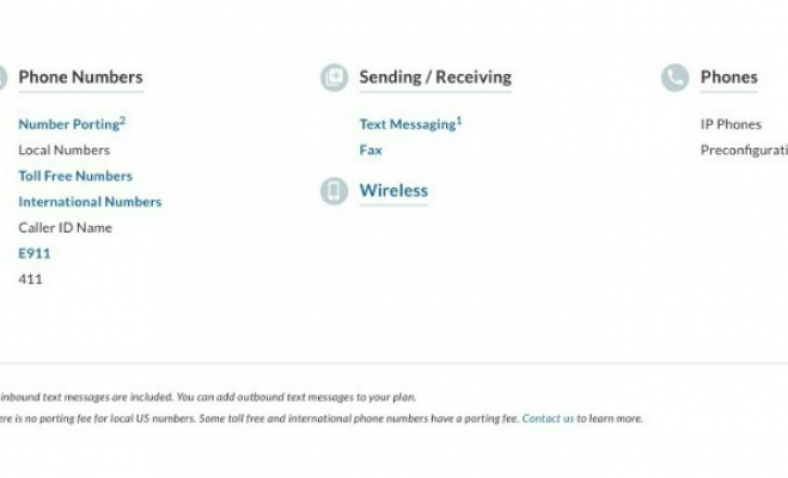 Internet fax (inbound and outbound) costs $1/month for the dedicated phone line, and then uses the minutes from your plan. Telzio offers voice conference calling, but not video conferencing at this point. Telzio may not have as many advanced features as other providers, but they do include features such as call recording, HD voice, voicemail to email and text transcription for free as part of their standard service. 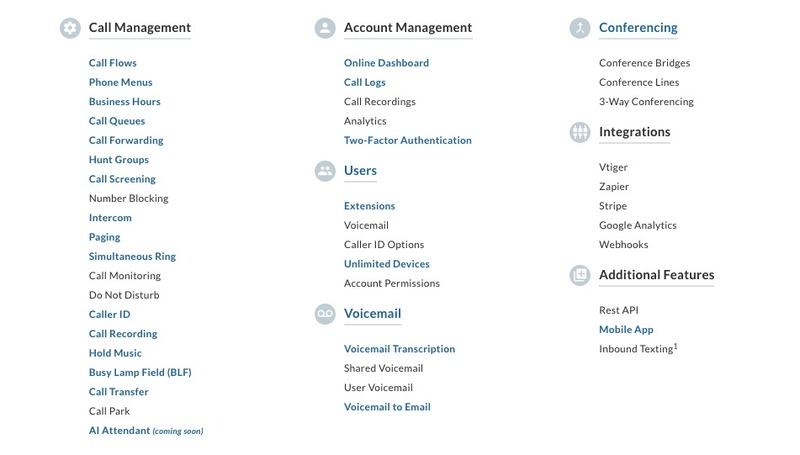 These features many times are features that most other cloud phone system providers charge extra for. One other nice feature allows you to send “voicemails” directly to your email rather so you can easily check messages without having to log into the system. Telzio has proven to be extremely reliable – they haven’t had an outage in over 2 years. The last outage they had was caused by their carrier in late 2015, and lasted for 4 minutes – it impacted about 12% of of their customers. They do provide a Service Level Agreement as an add-on service and terms and pricing are negotiated on a case by case basis. Telzio provides full backup infrastructure in 4 locations in different places of the world. For security reasons, they do not comment on number of servers or server locations, however. Telzio was by far the quickest and easiest phone system we have setup. 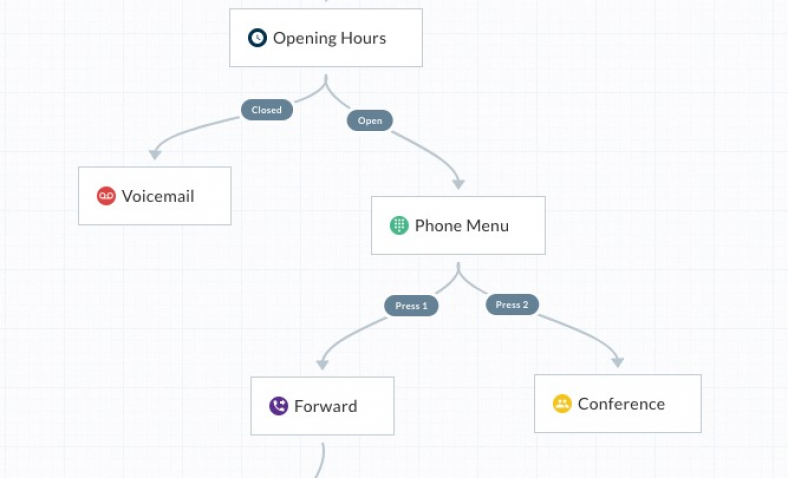 The call flow is all drag and drop for quick setup and customization. 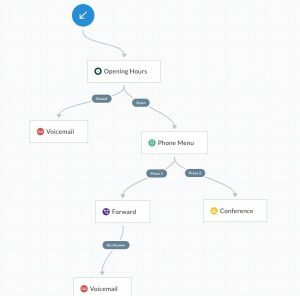 We had our call flow, voicemails, and messages configured and setup within 10 minutes. Being able to visually see your call flow is extremely helpful. 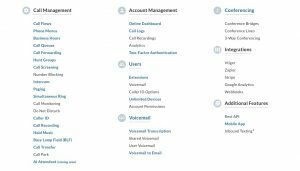 When setting up voicemails and messages you have the option to record directly within the Telzio system, type a message and pick a voice (English Man – US, English Woman – British, German Woman, and many more options), or upload a pre-recorded message. These features alone make the system quick and easy to setup. Rather than having to record a message using a third party tool and upload. They offer and extensive knowledge base with real examples, as well as a video library with step by step guides. If you need extra help or have questions support agents are easily accessible via live chat, phone, and email. The questions we had were answered quickly and by someone with extensive knowledge of the system. Telzio could easily be setup by anyone – even persons with limited knowledge and background using a business phone system. Telzio offers a mobile app for IOS and Android from which you can receive and make calls using your Telzio system. They will be launching a web based phone (using webrtc) by the end of April 2018, that will allow you to make and receive calls right from our website. Alternatively, you can use any SIP enabled softphone app like Bria or Xlite. You can purchase IP phone from Telzio, purchase your own, or use existing IP phones you may have. This may however require special adaptors, depending upon the phone. The also offer ATA adaptors that allow you to use existing analog phones with the Telzio system. Telzio offers Live Chat and phone support Mon-Fri from 8am – 6pm PST. Email support is 24/7 – and if you sign a SLA with Telzio, you will also be given a 24/7 direct phone number and a dedicated technician who knows your account inside out. Support is US Based out of the Los Angeles Headquarters. As well as a few people located in the Copenhagen, Denmark office, who provide tech support in European daytime and early mornings of US EST time. They provide an extensive knowledge base with step by step instructions on setup and configuration, as well as video tutorials. Pricing starts at $50 for one local or toll free number and 1,000 pooled minutes. With Telzio pricing is based on shared usage of pooled minutes, not on a per user model. Overage charges for minutes over the plans included minutes can be steep, so keep a close eye on your usage and if you think you need more it’s best to upgrade your plan minutes. Additional minutes can be purchased in increments of of 1,000 for $39/month. 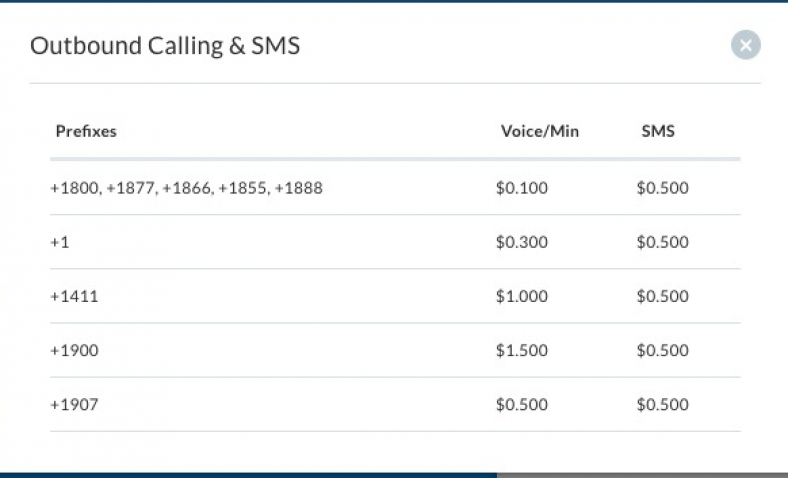 You can also purchase SMS minutes in increments of 500 minutes for $17/month. Additional phone numbers can be purchased for $1/month. Telzio offers a full 30 day FREE trial. That means you can try the fully featured Telzio system for 30 days before deciding. Because Telzio starts out at $50 on the low end of their pricing, they may not be the best option for a single person (or even a few person) business who is simply looking to have a professional sounding greeting and be able to route calls to other phones – mobile phones for example. In this case you would be better off with a solution such as Grasshopper where you can easily route calls to mobile phones and you get unlimited minutes. On the other hand if you are a business with multiple people or teams located in different locations and are looking for a small business phone system with features similar to RingCentral and the likes – that brings all of these people under one umbrella, that is easy to setup and maintain, and will have you up and taking calls in 10 to 15 minutes from purchase – then Telzio is the perfect solution for you. We would even go as far as to say we would recommend Telzio over the likes of RingCentral, Phone.com and others for the simple fact that you are paying for total minutes used, not on a per user basis such as the other other big players in this space. This pricing model combined with their ease of use and fast setup put them way ahead of the competition. The only caveat we make is that you do have to monitor the minutes you are using, and be sure to upgrade your plan minutes if you notice you are getting close to using all of them. Ease of Use: Telzio is by far the easiest system we have used. 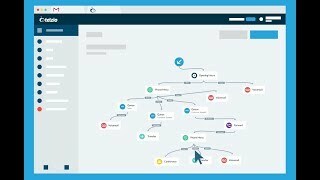 It's drag and drop call flow system makes it a breeze to setup and configure even the most complicated call flow/management setups. Not only is setup easy and quick, but on-going maintenance such as adding users and extensions is a breeze. Billing Model: We like the fact that you are paying for minutes you use, rather than paying for persons in your organization. We all know that phone usage is not created equal – not everyone in our organization that needs a phone, uses their phone to the same extent. So why the same price for everyone? With Telzio you could have 6 people using your 1,000 minutes for $50/month, were-as with someone like RingCentral this would cost you close to $120/month and you wouldn't get features like call recording, integrations to CRM, and helpdesk applications, or faxing. High Cost for Beginner Plan: The cost of $50/month for say a single business owner or even a business with 2 or 3 people that is simply looking to forward calls is a bit high when there are alternative systems from other merchants available. However this isn't really the market that Telzio is trying to capture either. 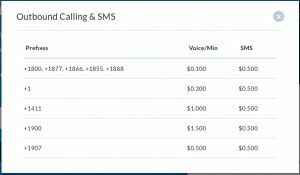 There are plenty of low cost, shared minute, call routing companies out there – Grasshopper and Phone.com being two great options for this. Telzio is looking to capture the small business that has multiple teams or locations that they are looking to bring together with a fully featured business phone system. Think offices or remote locations needing digital phones, call recording, conference calling, faxing, integrations to CRM and Help Desk applications and more. we are excited to see another high quality option enter the cloud phone system market. Telzio has built a team with decades of experience building highly scalable streaming platforms, resulting in the current platform that is being used by companies like Facebook, Airbnb and Lyft. We were impressed by their features, ease of use, fast setup and configuration, and outstanding reliability statistics. We feel they are an easy top contender in this space for companies looking for a reliable, feature rich small business phone system.